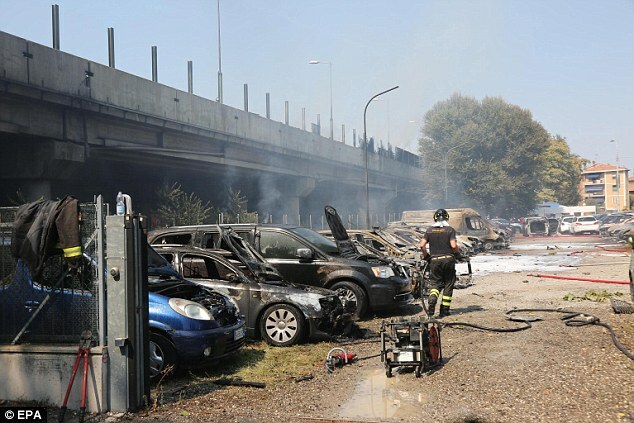 This is the shocking moment a petrol tanker slammed into the back of a truck on a highway near the Bologna airport in Italy on Monday, causing a huge explosion which killed at least one person and put dozens in hospital. CCTV footage shows the petrol tanker driving straight into the vehicles in front at high speed, immediately catching fire. 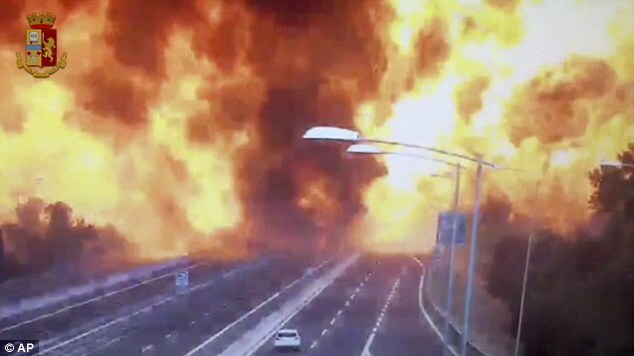 Some time later, when surrounding unharmed vehicles have been evacuated from the motorway bridge, the burning trucks cause an almighty explosion. Explosion: CCTV footage shows the moment the petrol tanker exploded, collapsing a part of the motorway bridge near Bologna airport, Italy. 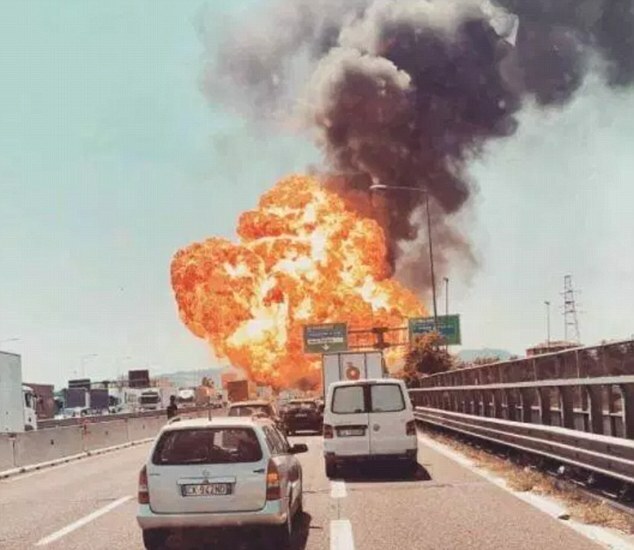 Italian authorities have named the deceased as the tanker's 41-year-old driver, and has said 70 people were injured, some with serious burns. Italian Prime Minister Giuseppe Conte has today visited victims of the crash, saying that it was important to understand what happened to prevent future tragedies. 'I am here today to demonstrate the closeness of the government to the people who are suffering, but also to understand why so that these things are not repeated,' Mr Conte said. 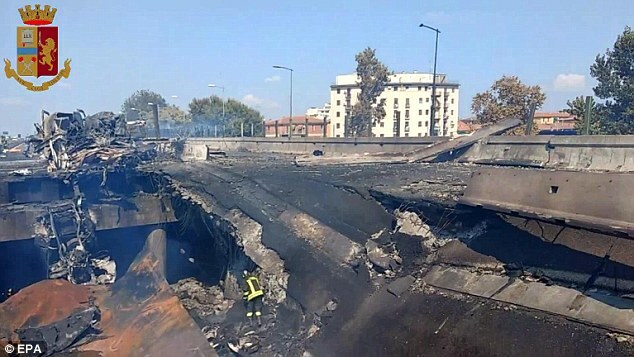 Prosecutors have opened an investigation into the Bologna accident, triggered when the tanker truck carrying liquefied petroleum gas, or LPG, rammed into a truck stuck in a line of traffic. 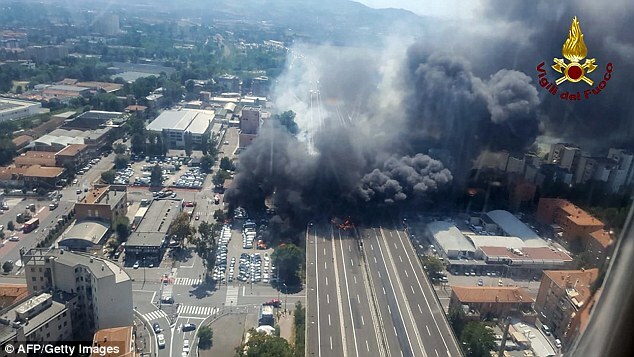 A huge explosion has taken place near an airport in Italy this afternoon amid reports or a road smash involving a petrol tankerThe tanker immediately caught fire, and then exploded a short time later across eight lanes, collapsing part of the raised highway. Police video shows that by the time of the explosion, most vehicles had been evacuated from the highway. Dozens of people were injured, many with burns or cuts from flying glass when windows of buildings nearby were shattered in the blast.